But you know how things go, and money is soon forgotten. I noticed the name of a band called The Stylers on one of the LP?s, and that is why I wanted to take them home. I have another LP by The Stylers, from the same period that these records were made, 1970-1072, and that sounds like surf music made in Bollywood. I don?t really like the singing, but the music is great. Not a record that I play each week, but interesting enough to pay far too much money for five damaged LP?s, that might contain similar music. Well, three did not, but two did. Since I can?t read the language, all I know is the few words that are in English: stereomono, all rights reserved, Singapore and The Stylers. The pictures on the inner sleeve seem to indicate that this is the soundtrack of a movie, and not one which I am dying to see. But no complaints: a song like this makes it all worth it! 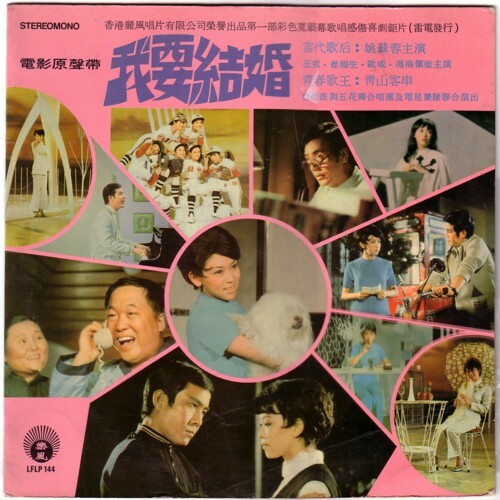 This LP is a soundtrack from a 1970 film called 我要結婚 (Beautiful Dreamer) starring the famous Taiwanese singer 姚蘇蓉 (Yao Su Yong). She is the girl seen in the center circle on the cover. 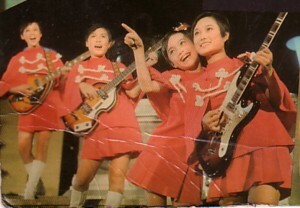 The second picture (of the cute girls playing guitars) looks like 蔡咪咪 與 五花瓣合唱團 (Cai Mi Mi & The Five Petals).